JACKSONVILLE - Jonathan Bane (6'4, 205) signs with the Jacksonville Sharks for his fifth year of arena football and first with the Sharks. 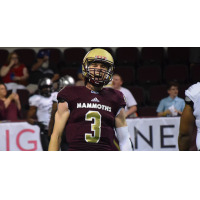 Last season, Bane signed with the newly formed Maine Mammoths and became one of the NAL's top quarterbacks, During his time in Maine, Bane started 14 of the team's 15 games completing 249 passes for 2,689 yards, and 59 TDs. On the ground, Bane led the team in rushing with 141 yards on 30 carries and scored four rushing touchdowns for the Mammoths. Despite the team starting in the NAL 1-7, Bane and the Mammoths turned it around winning all six of their last games and finishing the year 7-8, only one win away from a playoff berth. By joining the Sharks, Bane will also reunite with former teammate and All-NAL Wide Receiver Devin Wilson. Together Wilson and Bane became major factors in the Mammoths win streak defeating Carolina (55-29), Columbus (42-35), and Jacksonville (43-36). Prior to the Mammoths, Bane had a stint with the High Country Grizzlies in 2018 of the AAL, split time between the Colorado Crush of the IFL and the Bismarck Bucks of the CIF in 2017. In 2016, he led the Bloomington Edge of the IFL and played for the Tampa Bay Storm of the Arena Football League. Bane began his pro career with the Richmond Raiders where he spent both the 2014-2015 seasons. Mammoths Coach James Fuller, served has his head coach for both years with the Raiders. In 2015, Bane earned PIFL Offensive Player of the Year and was awarded First Team All-PIFL. During his college career, Bane played for Dakota Wesleyan University where he played from 2010 to 2013. During his career as a Tiger, he threw for 9,224 yards, 1,360 completions, and 83 touchdowns. Bane set the school record for most passing yards in a single game (457), longest pass in a single game (99), and most passing yards in a season (2,817). Bane finished his college career as a 2x All-GPAC honorable mention (2012,2013) and a Second Team All-GPAC in 2011. Bane is a native Texan, who grew up in Temple, TX he played for Rogers High school in Rogers, TX before transferring and finishing school at Temple High School.